"This ain't training. In training they just give you an F. Out here you get killed." Oscar winner Denzel Washington really has bad luck when it comes to trains. Last year, one of his trains gets held hostage by a maniac underground in The Taking of Pelham 123. And now he's trying to stop a speeding half-mile long unmanned locomotive that (due to a series of miscalculated events) is charging through the state of Pennsylvania in Unstoppable. Someone should really tell him to try the bus every once in a while. And, oh yeah, that runaway train? It's carrying tons of toxic chemicals. In Unstoppable, Washington plays a train engineer who teams up with a rookie conductor (played by Chris Pine) on his first task on the job--transporting freight cars from one end of the track to the other. Everything is going fairly well--albeit the intermittent rookie vs. veteran banter-- until their train (now carrying 25 cars) faces a head on collision with the runaway train on the same track on its way toward a very populated area. The two men finally bond while committing to the heroic (and unbelievable) task of trying to stop the train before it takes out an entire town. 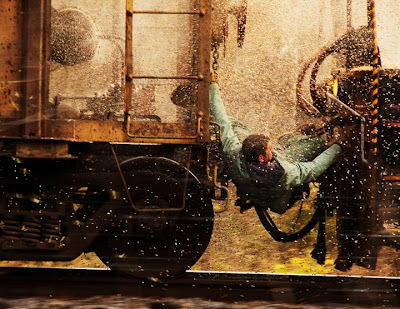 Packed with stunts that would make even Tom Cruise grimace, Unstoppable is an adrenaline-fueled action flick that leaves you at the edge of your seat until the very end. It's a race against time, when time is really not on your side. It'll also make you think twice about taking the train. p.s. Cool new look, too! When I first saw the trailer for this all I could think of was that it looked like another Speed movie. Everyone seems to be liking it though, I'll have to check it out.